Mr. E.O has received his MWO and has started the treatments. We are going to help him in the beginning as we have a bit experience about the MWO. Until now we have treated about 450 people, part of them even 5 to 10 times. We have had a lot of discussions with people who receive more information from other levels than we do. There have been two or three cases that after treatment they have felt really fine, but after a few days these persons have gone psychically really 'down'. They have recovered in time. We have been given and explanation that there souls have gone along the path of enlightenment much faster than the body. Now when the body receives enormous amount of light from the MWO, the soul gets frightened and does not feel well at all. These people also suffer from various diseases that have perhaps a karmic origin. Perhaps they should learn something from the diseases also before full enlightenment, who knows? Well, these cases are so few that it is not a problem, but it is also good to know that it is possible. We have heard about so many amazing positive recoveries from illnesses that we know that the machine can do almost anything. Foto van Hessel, Karl en Tuija Peipo, de mensen uit het noorden van Finland. 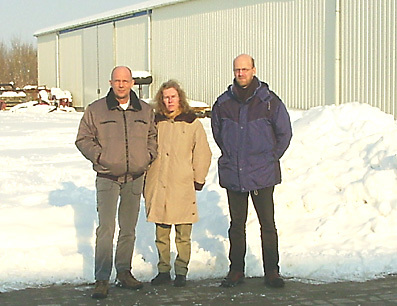 Zij bezochten mij in 2005. We are just now going back to Lapland after a long tour in the southern Finland. We are going to move near town Turku in the end of November, so it is a lot easier to travel in the future.